In today's tech-based business climate, computer networks drive communication and information exchange across a wide range of industries. These networks range in size from local area networks (or LANs) with a small number of users to wide area networks (WANs) that cover multiple locations across an extensive geographical area. Networks require constant supervision and support, and this responsibility is handed to network administrators. These professionals monitor network traffic, perform hardware and software upgrades, evaluate the network's overall performance and take measures to protect users from hackers, viruses and other outside threats. Many network administrators get their start in a bachelor's degree program. The curriculum is heavily concentrated in computer science and information technology. Students are introduced to fundamental areas of the profession, such as operations management, systems analysis and network security. Other courses cover subjects like mathematics, software engineering, business administration and project management. Many of today's students are choosing to earn their bachelor's degree in network administration online. Web-based programs follow the same rigorous curriculum as brick-and-mortar options, leading to the same number of opportunities for online graduates. The asynchronous (or self-paced) schedule of most online degree programs is also ideal for students with part-time jobs, childcare duties and other commitments that may interfere with on-campus learning. Learn more about what you can do with an online bachelor's degree in network administration and what kind of career opportunities you can look forward to with this comprehensive guide. WILL AN ONLINE NETWORK ADMINISTRATION BACHELOR'S PROGRAM PROVIDE ME WITH THE SKILLS I NEED TO ADVANCE MY CAREER? Online bachelor's in network administration programs usually take a comprehensive approach to the subject. Students learn various methods and strategies for developing and installing networks, troubleshooting different problems and ensuring the system is secure for all network users. Many degree programs culminate in a capstone project, which allows students to demonstrate the skills and knowledge they have gained through a research or practicum-based project. The best online bachelor's in network administration programs also prepare students who plan to earn professional certification in specific areas of the field. WILL AN ONLINE NETWORK ADMINISTRATION BACHELOR'S PROGRAM WORK WITH MY SCHEDULE? An online bachelor's in network administration provides a flexible academic alternative to traditional, classroom-based education. Students will be able to access course lectures and readings, participate in class discussions with fellow students, submit written assignments, take exams and contact their professors all from the comfort of their home computer. Current technology also allows them to study on the go using a laptop, tablet, smartphone and other Wi-Fi-compatible devices. Additionally, faculty members will be on hand to provide virtual career counseling and advisement about graduation, capstone projects and other programmatic requirements. WHAT JOBS CAN I GET WITH MY NETWORK ADMINISTRATION BACHELOR'S DEGREE? Most careers in network administration are attainable with a bachelor's degree. The network and computer systems administration field is relatively large; the Bureau of Labor Statistics (BLS) estimates that more than 380,000 professionals are currently employed in this field, and the ten-year industry projection calls for roughly 30,000 new jobs by 2024. Other common career pathways for network administration degree recipients include network architects, information security analysts, systems analysts and computer programmers. WHAT ARE THE BEST ONLINE NETWORK ADMINISTRATION BACHELOR'S PROGRAMS? Choosing a program is an incredibly personal decision, and only you can properly evaluate whether a target school's strengths match your educational needs. The following ranked list of schools should serve as a helpful starting point in your search for the best online bachelor's degree in network administration programs in the United States. 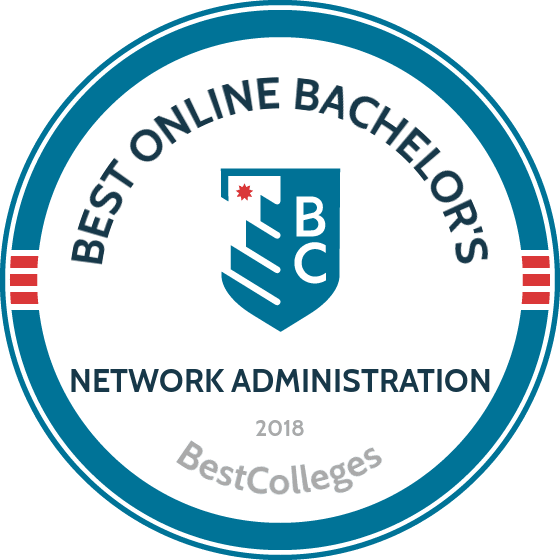 If you are considering an online bachelor's in network administration, be sure to contact admissions specialists at different colleges and universities to learn more their about specific bachelor's degree requirements and offerings. One of the 28 Jesuit colleges in the United States, Regents has offered comprehensive education to students since 1877. U.S. News & World Report has ranked the Denver-based school as a “Top University in the West” for 18 consecutive years, and Regents also boasts a top ranked online program that enrolls students from all over the world. Students earning an online network administration degree at Regis study the fundamental concepts of analysis, design, and security architecture of computer networks along with other networking technologies. The program covers real-world and business applications of networking along with the latest strategies for addressing network security issues including hackers, viruses, and cyber vandalism. Based in Albany, NY, Excelsior University is a private, nonprofit institution that specializes in meeting the academic needs of adult learners. Excelsior’s online bachelor of science in information technology with an emphasis in network operations provides an introduction to major concepts and technologies used in areas such as network system design, wireless networking technology, project management. Consisting of 120 credit hours, the network administrator online degree includes a 3-credit integrated technology assessment capstone. Major coursework imparts the skills needed to identify, analyze, and integrate information technologies and apply current standards to major issues in information technology. Students learn to think and solve information technology problems independently, as well as in professional team-based settings. Prospective students should submit official transcripts along with their application. Those wishing to transfer credits from other regionally accredited institutions may need to provide syllabi information from previous coursework, if requested by admissions counselors. Based out of Nebraska, Bellevue has been an innovator in education since its inception in 1966, and the school continues that tradition with a diverse assortment of online learning programs. Emphasizing support for nontraditional students, the college ranks as a top school for both adult learners and military veterans. Bellevue’s online network administration degree is specifically designed for students who are already working in IT positions or have earned an associate degree and want to advance their careers with greater network expertise. Students gain technology skills necessary for the administration of complex networks, including designing, installing, managing, and modifying both computers and network systems. The program emphasizes hands-on learning, with online students making use of virtual simulations to gain practical experience. Over half of all students enrolled at this Kansas institution earn their degree through Fort Hays State University’s Virtual College. Those wishing to pursue careers with telecommunications companies or other computer and network organizations typically seek a BS in information networking and telecommunications. This 124-credit network administration degree online introduces the fundamentals of network architecture and data communications, as well as web development, technology, innovation, and law in cyberspace. Learners may choose from program concentrations in informatics, network security, geographic information systems, or focus on acquiring the skills needed to obtain advanced Cisco certifications. Applicants must submit official transcripts and relevant standardized test scores. Students over 21 years of age are not required to provide ACT or SAT scores. FHSU offers numerous scholarship and tuition assistance opportunities for veterans and active duty military personnel. Dakota State University’s BS in network and security administration lets distance learners master the fundamentals of networking, business management, cybersecurity, and digital forensics. Major coursework for the 120-credit network and security administration degree explores security and management, operating environments, routing and switching, and script development for network administration. In their seventh semester, students complete either an internship or a student research course. Program candidates should submit high school transcripts or proof of GED completion, as well as an ACT score of 18 or higher, an SAT score of 870 or above, and a cumulative GPA of at least 2.6 or class ranking in the top 60%. Transfer students with more than 24 hours of college-level credit must submit all transcripts for evaluation. Florida State College at Jacksonville’s 120-hour online bachelor of applied science in computer systems networking and telecommunications offers the technical training and management skills needed to work in specialized areas of networking and telecommunications, such as network flow optimization. In addition to 36 hours of general education coursework and a foreign language requirement, students complete upper and lower division courses that explore concepts in network management, information security, system design and analysis, and network and telecommunication troubleshooting. Most students earn their degree within 20 months. Individuals applying to the network administrator degree online program must hold an associate degree or 60 credit hours of undergraduate coursework from a regionally accredited institution, as well as a GPA of 2.0 or higher. FSCJ offers credit for personal, professional, and military experience through prior learning assessments, portfolio work, or industry certifications. A major regional university in Burlington, Vermont, Champlain’s history of academic excellence dates back more than a century. Ranked among the “Most Innovative Schools” in the country by U.S. News & World Report, Champlain also offers one of the best online network administration programs available. Students at Champlain can earn a bachelor’s degree in computer & information systems that also includes a certification in computer networking. The program includes courses on modern computing practices along with the interpersonal skills necessary for success in a business environment. Students receiving network certification also study relevant topics including telecommunications, server administration, network design, and wireless networking. Online students at Champlain can take accelerated courses lasting seven to eight weeks in order to complete their degrees more quickly and conveniently. Situated on a 200-acre campus in Greensboro, North Carolina, NCAT is one of the largest agricultural schools among the nation’s historically black colleges (HBCs). The school is home to over more than 10,000 students, and NCAT has offered distance education courses for over a decade. Network administrator online degree students can pursue a bachelor of science (BS) in information technology. One of the school’s newer online programs, the information technology degree gives students an in-depth understanding of servers, networks, mainframe/enterprise systems, digital storage, and cloud environments. The degree also emphasizes mainframe education, a rapidly growing sector of IT that is in high demand among employers. A private university in in Manchester, New Hampshire, SNHU operates a 300-acre campus that first opened in 1932. The school ranks as one of the fastest growing in the country, and SNHU also maintains an online program that serves over 60,000 students. Consistently ranked as a top online school, it’s no surprise that SNHU is a popular choice for students seeking an online network administration degree. SNHU offers an information technology degree with a concentration in network & telecommunications. Featuring practical, applicable coursework that integrates theoretical concepts and real world practices, the program gives students the analytical and technical skills necessary to address network system issues and enhance network performance for large organizations. Middle Georgia State University’s BS in information technology with an emphasis in network technology and administration is an online network administration degree program that combines core information technology coursework with an introduction to systems administration and network security. Examining concepts in server and database administration, network security, and virtual computing, the 120-credit curriculum also provides a broad introduction to database principles, project management, and the foundations of information assurance. Students learn to analyze networking requirements and desired outputs, and build and maintain networks according to defined needs. The program culminates in a capstone course, in which learners design, implement, and evaluate an information system. Program applicants must supply ACT or SAT scores, official transcripts or GED exam score, and proof of residency. A growing number of businesses and organizations rely on computer networks, and steady industry growth indicates that qualified professionals will be in-demand for years to come. As a result, the employment outlook for network administration personnel is quite favorable. U.S. News & World Report notes that the 'computer systems administrator' career path now faces an unemployment rate of 2.0%; by comparison, the national unemployment rate is currently set at 4.9%. Using U.S. News data, the following table compares the unemployment rate of network administrators against the rates of other related tech careers. As the table indicates, computer systems administrators are tied for the third lowest unemployment rate of all careers listed. With a healthy 10-year outlook for network administrators and the tech industry as a whole, students who earn online bachelor's degrees in this field should continue to enjoy steady unemployment rates. In addition to favorable unemployment rates and job security, students who earn an online bachelor's in network administration also enjoy high earning potential. According to the 2015-16 PayScale College Salary Report, the median annual salary for college graduates with a bachelor's in 'computer and network administration' is $50,800 during the first five years on the job and $66,900 after 10 years in the workforce. Both of these figures are higher than the $48,320 median annual salary for all occupations, as projected by the BLS. The table below looks at salary expectations for network administration majors and recipients of bachelor's degrees in other tech-centric fields. In addition to undergraduate majors, specific job titles also determine the earning potential for network administration degree-holders. Other important factors include employer size and city/state of employment. The next table explores career salary growth rates for network administrators and other common pathways in this professional field. All careers listed on the table experienced career salary growth of more than 20%. Network engineers saw the highest growth rate: a 44.7% increase between the entry-level and late-career stages. Network operations managers placed in a close second, with 44.5% earnings growth after 20 years in the workforce. Students who graduate with an online bachelor's in network administration will be qualified for dozens of entry-level positions, as well as some supervisory roles normally reserved for job candidates that have received a formal college education. Four of the most common careers for network administration degree recipients are detailed below. Network and Computer Systems Administrators: These professionals handle day-to-day management of network operations and activity. They are often responsible for installing new networks, upgrading components, running security checks and adding new users. Network Architects: Network architects design, develop and construct various types of networks, including LANs, WANs and customized systems. Their blueprints must take certain factors into account, such as coverage, information security, accessibility and efficiency. Computer Systems Analysts: These analysts create computing systems and networks based on the specific needs and capabilities of individual companies and organizations. They must assess the day-to-day operations of each client in order to create systems that are efficient, cost-effective, secure and applicable to the employees that will be using them. Information Security Analysts: Information security analysts monitor the computing systems and networks of their company and organization. They specialize in mitigating human threats like hackers and cybercriminals, as well as other issues like computer viruses, network outages and malfunctioning hardware or software. Making professional connections and learning about different approaches to network administration is crucial to your success. Professional organizations offer a great entry point for students who want to learn more about their chosen career path. Below you'll find three of the country's most prominent organizations established for network administration professionals. These organizations host networking events, provide online trainings, maintain active job boards, and offer other services for career-ready college graduates. Network Professional Association: The NPA supports computer networking personnel through advocacy, professional development and networking events. The association's website features information about the CNP certification credential, as well as an online career center, an electronic journal and an events calendar. Association of Information Technology Professionals: Founded in 1951, the AITP is considered one of the largest global organizations for IT managers and personnel. The association hosts 55 U.S. chapters across nine regions of the country, and also sponsors college chapters at postsecondary institutions in 36 different states. Information Systems Security Association: Currently representing more than 10,000 members across the globe, ISSA is a non-profit organization created to provide professional development and advocacy for information systems security personnel. The organization maintains local chapters around the world, including 99 U.S.-based chapters. Other perks for members include an invitation to ISSA's yearly international conference and full access to the organization's online, peer-reviewed journal.